Hillsborough Sheriff, On December 29, 1999, Marsha Ihde, 49, Parrish, Fl., drove her 1992 Chevrolet van northbound on the Skyway Bridge. She stopped the vehicle, approximately 100 yards south of the center span. Witnesses reported to the Sheriff’s Office, she then climbed up on the railing and sat down. Before witnesses could reach her, she either jumped or fell off the bridge. Ms. Ihde’s body was recovered by the St. Petersburg Police Marine Unit boat approximately 25 minutes later. This is the eleventh death in 1999, associated with the Sunshine Skyway Bridge. 12.09.99, J. O., St. Pete, FL., 10pm - don't know the details, may be false alarm - I view the Skyway from my balcony and currently there are 5-8 police cruisers at the top of the northbound side of the bridge. Boats / choppers are also circling the bridge area...2nd time in 1 month? Of course, nothing indicated on any local news broadcasts? tbo.com, Drove with woman to top of span. She attempted to stop him as he left the vehicle and jumped. 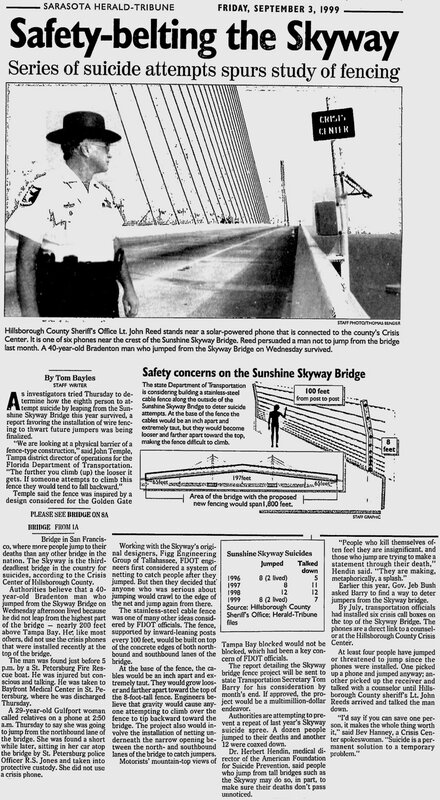 11.14.99, St. Petersburg Times; St. Petersburg, Fla.
Two St. Petersburg police officers thwarted a suicide attempt Saturday at the crest of the Sunshine Skyway bridge. About 5 p.m., officers Maurice Steffek and Gabriele Ritzheimer responded to reports that a man was trying to climb over the guardrail on the bridge, authorities said. As the man hung by one arm from the bridge, the officers grabbed him and pulled him back over, said Detective Lisa Haber, a spokeswoman for the Hillsborough County Sheriff's Office. The 39-year-old Tampa man had been riding in a car traveling south to Manatee County. At the crest of the bridge, he asked the driver to stop, got out of the car and began to climb over the guardrail, Haber said. The driver, Johnny Addison of St. Petersburg, picked up one of six cellular phones that ring at the Crisis Center of Hillsborough County, Haber said. Counselors there contacted law enforcement. Addison held onto the man until police arrived, Haber said. The man then broke away from Addison and jumped over the rail, holding on with one arm. Police officers pulled him back over. Hillsborough sheriff's deputies took the man to South Bay Hospital in Ruskin under Florida's Baker Act, which allows officials to hospitalize someone deemed a danger to himself or others. 12.17.09, Bill B., Bradenton, FL., Every time I read about a suicide from atop the Skyway Bridge, I think about the day in November 1999 when I was fortunate to be involved in the rescue of a man intent on ending his life, via a jump from the northbound side of the span. And his jump would be one he could (not) survive, as he was attempting it over the rocks that surround the center supports, instead of over the water. The driver, with whom he had hitchhiked, and a St. Petersburg cop, held him by his arm and in headlock, while he pleaded to be let go. I was a random passerby, heading south, and arrived just after the police got there. I stopped and jumped over the bridge's center, knowing that I had to do something - anything - that might help. I begged the jumper to please let us help him, to please let me help him and he finally agreed. Because of his size, we had to wait what seemed like hours, until more cops arrived, giving us the needed muscle to pull him over the railing and back to safety. During this time, cars continued to just pass by with not one stopping to offer their help. That, by itself, is one of the poorest testimonies of humanity I have ever witnessed. Considering the volume of traffic that crosses the span daily, I can't imagine that April's car was not passed by numerous vehicles prior to her ending her life. I didn't know April but, nonetheless, I would have stopped to see if assistance was needed, even if it was only to discover an automotive breakdown or a foolish tourist stopping to take photographs of the Tampa skyline. We live in a society stricken by fear and ambivalence. I shudder to think what might have happened had I not stopped on that November day when another fellow human being needed my help. I was scared as hell, during the rescue, and collapsed into a sobbing heap when it was over. Friends and acquaintances told me how foolish I was to do such a thing, as I, too, might have been pulled over to my own death. But I would do it again in a cold second because every life is precious. April's was no less precious. Reading the posts on this page tells me she was loved by those who cared enough to share their own sentiments about her passing. I'm saddened that April was successful because who knows what great things this young lady might have accomplished in the years ahead. April, I'm sorry for the loss your friends are feeling. Your passing will forever be emblazoned in their minds, but your life will go on in their memories. You're in God's hands now and are no longer troubled by whatever drove you to take your life. Watch over your friends - all of them. You can do much good where you are now. And I pray that you will help others find the good in their hearts, so when they are a random passersby and see someone in trouble, they will hear your voice telling them, "help me" before it too late again. Rest In Peace, child. Sheriff's deputies have identified a man who jumped to his death from the Sunshine Skyway bridge on Thursday afternoon as Finley B. Myers. Myers, 82, of Treasure Island, was seen jumping from the bridge about 1 p.m. His body was recovered by the Coast Guard. tbo.com, Seen climbing over side and jumping from southbound side of center span. Body recovered same day. 10.05.99, pay-per-view abstract, St. Petersburg Times, A 56-year-old man apparently jumped to his death off the Sunshine Skyway Bridge about 2:50 a.m. Monday, Hillsborough County sheriff's deputies said. tbo.com, Car found abandoned on southbound side of center span. 03.20.10, carrie, my aunt died when i was a senior in high school . she went to tampa when she was 18 or 19 and lived there the rest of her life apart from 97 and 98 she had came up to stay with her family. she had four sisters my mom was the baby of five girls susan was next to youngest. so she stayed with us until we found her a little place to live . it was so much fun because susan was the cool aunt the one who would let us smoke or cuss . i could talk to her about anything and feel so much better instead of the usual regret we have with parents. and she was so beautiful. she was a knock out when she was young and still a gorgeous lady too. you know how some women just stay beautiful and almost look better at 40? she was beautiful on inside and the out. and just so cool. but there were times when she wasn't herself. it would be her bi polar coming round to play i guess although i was young and didn't understand why she was so absent . ,anyways to make it short she left her parents (a father who pastored a church and the kindest man you ever met and a mother who adored her ) and four sisters to come back down there and sale insurance. those two years was all i got with her. its 2010 and i finally got the guts to try to look up some info on the matter maybe a newspaper or something. but this was the first thing i came across and i started scrolling down 2000 and then 99 . there was hardly any descriptors for anyone except for a woman who murdered her ex and jumped and survived she was called an idiot which of course is correct. ... she was a person to me one of the only people in my life that ever made me feel special and loved. ... i knew i was taking my chances on here after reading some comments made by angry family members but it looked like good information on here and there was so i thank you for that. tbo.com, Jumped as witnesses attempted to help her. She had been standing beside her car in southbound lanes of center span. A 40-year-old Bradenton man who jumped from the center span of the Sunshine Skyway in an apparent suicide attempt Wednesday survived the nearly 200-foot drop, authorities said. Motorists on the Skyway told authorities that the man walked up the northbound side of the bridge and jumped from the top shortly before 4:30 p.m. A St. Petersburg Fire Rescue boat found him in the water just before 5 p.m., conscious and talking, said St. Petersburg fire Lt. Chris Bengivengo. "It's about a 20-story drop," Bengivengo said. The man, whose name is being withheld to protect his privacy, suffered severe injuries, according to the Hillsborough County Sheriff's Office. He was rescued about a quarter-mile from the St. Petersburg shoreline and was taken to Bayfront Medical Center. People who jump from the Skyway rarely live. Anyone who falls from a point close to the center of the bridge hits the water in about 3.5 seconds at about 75 mph. The impact usually breaks bones and ruptures organs. If they aren't killed, they typically are knocked unconscious and drown. Only three other people are known to have survived the fall from the central span of the bridge, opened in 1987, according to the Hillsborough Sheriff's Office. A 40-year-old Tampa man survived in May. In 1996, a 52-year-old Sarasota woman and a 44-year-old St. Petersburg man each survived the drop. The Skyway is the third-deadliest bridge in the country for suicides after the Golden Gate Bridge and San Diego's Coronado Bridge, according to the Crisis Center of Hillsborough County. Six people killed themselves on the Skyway in 1996, eight in 1997, 12 in 1998 and several this year. In July, six phones were installed on the Skyway to provide a direct line to the Crisis Center for anyone considering suicide. tbo.com, name not available, 40, male, lived, Walked up northbound side of bridge, jumped from top. Rescued, conscious and talking, several minutes later. A Tampa man died after apparently jumping from the Sunshine Skyway bridge Tuesday. Hubert Carter Phillips, 42, of [address withheld], left his 1986 Chevette parked on the bridge early in the morning, said Debbie Carter, spokeswoman for the Hillsborough County Sheriff's Office. A passer-by saw him standing next to the car and called authorities about 6:30 a.m. When deputies arrived, only the car was there, with Phillips' wallet on the front seat. The Coast Guard recovered his body about 90 minutes later. 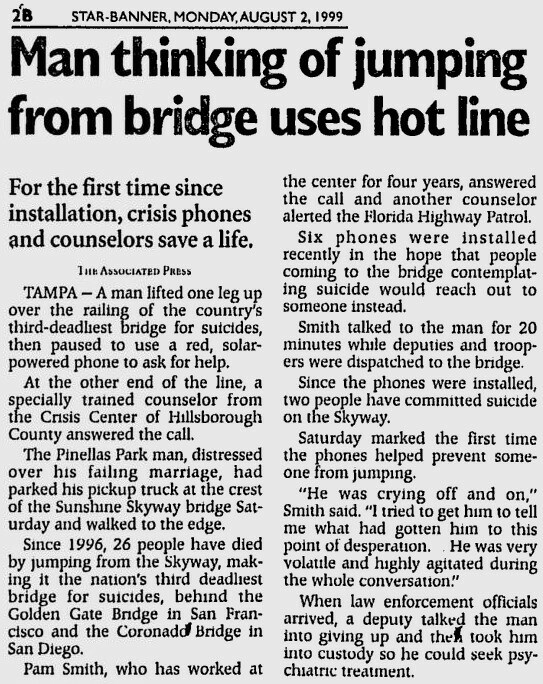 07.31.99: save, male • first success for the skyway crisis phones. A 66-year-old man jumped to his death off the Sunshine Skyway bridge Tuesday morning, less than a week after signs were posted alerting the public to emergency telephones on the bridge. Hillsborough County sheriff's officials said David Maass, of [address withheld] in Bradenton, parked his Chevrolet pickup truck on the center span, and his body was found on the rocks below shortly before 3 a.m.
Maass did not try to use the phones, according to Vicki Hawkins, the director of hotline services at the Hillsborough County Crisis Center, where specially trained counselors staff the phones 24-hours a day, seven days a week. "Our sympathy goes out to the family. We wish that he had called and reached out for help, but we know that the service will be there for the ones who do want help," Hawkins said. Maass is the second person to jump from the bridge since the installation of the phones. But he is the first to leap since blue signs saying "Crisis Center" were installed. Family members said Maass, who was a retired power company worker, showed no obvious signs of unhappiness Monday. But in hindsight, they said, he seemed a bit too sentimental with his 14-year-old granddaughter. "He told her that he was real proud of her and that she would go somewhere in life," said his daughter-in-law, Judy Hagin. Maass had lived in Bradenton all his life, Hagin said. Both his children died in recent years, one from a heart condition and the other in a car accident. "It had been a rough couple of years," Hagin said. Hawkins said that since the phones became operational in late June, several motorists have used them to report car trouble on the bridge. But she said the center has received no calls from people contemplating suicide. Since 1996, 27 people have died after jumping off the Skyway, making it the third-deadliest bridge in the country for suicides, according to officials. Only the Golden Gate Bridge in San Francisco and Coronado Bridge in San Diego have had more suicides, the officials said. 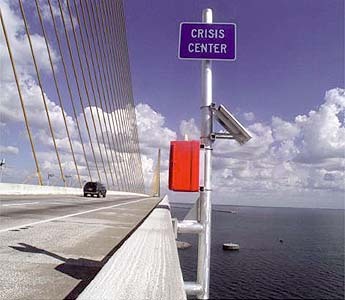 Neither of those bridges has emergency phones connected to a crisis center. The six candy-red, solar powered phones are spread out on the bridge, with three on the southbound side and three on the northbound side. By the end of the month, Hawkins said, caller-ID should be available on the phones so that counselors can identify exactly where callers are phoning from the bridge. The next time someone with suicide in mind stops at the crest of the Sunshine Skyway bridge, they will find a red box with a solar-powered phone inside. All they have to do is pick up the handset and push the red button, and a specially trained counselor from the Crisis Center of Hillsborough County will answer. "The purpose of the phones is for the crisis center to convince them there is another way out," said Sgt. Harold Winsett, who heads the crisis negotiating team of the Hillsborough County Sheriff's Office. "This gives them another option." The Skyway is the third-deadliest bridge in the country for suicides, said Crisis Center president Jerry Vazquez. Now it is the only bridge in the country with emergency phones connected to crisis counselors. The Golden Gate Bridge, No. 1 on the suicide list, installed emergency phones, but they ring to the bridge authority. The Coronado Bridge in San Diego, No. 2, has no crisis phones. Since 1996, 26 people have died after jumping off the Skyway. Most jump from the crest, 197 feet above Tampa Bay. By the time they hit the water 3.5 seconds later, their bodies are falling at 75 mph. Michael Yakes of Gulfport, whose sister Linda Blankenship jumped from the bridge in 1997, welcomes the new phones but worries they won't stop anyone. "There were motorist aid phones already at the bridge," he said. "A person could have picked those phones up." Vazquez said the phones most likely will help the person who has some doubt about whether to jump. "We hope it makes a difference," Vazquez said. "We can only be successful if a person is in a moment of ambivalence." The Crisis Center has been working for five years to get the phones in place, Vazquez said. Not even the assistance of state Sen. John Grant, R-Tampa, broke through bureaucratic inertia. But shortly after the first of the year, Grant got a call from newly elected Gov. Jeb Bush. How are those phones on the bridge coming? he asked Grant. They're not, Grant said. "All of a sudden I began to get tremendous cooperation," Grant said, including a call from the Florida Department of Transportation. Bush had toured the Crisis Center in March 1998 as Grant's guest and became acquainted with the phone project. The phones are part of an effort to make the bridge less attractive to people contemplating suicide. The other part of that effort, a barrier or net underneath the bridge, is being studied. With the help of GTE, the Crisis Center installed six phones on the Skyway, three on the north side of the bridge and three on the south side. Police reports showed that some people chose to jump from the concrete supports holding up the cables just before or after the crest, so four phones were placed in those locations. The other two are at the crest. Although the phones work, the entire system isn't fully operational. Each phone has caller-ID capability that will allow counselors to determine exactly where the caller is on the bridge. Right now, however, a bug in the system is interfering with that capability. Blue signs above the phones read "Crisis Center." Three telephones at the Crisis Center's hotline office are connected to the bridge phones. While one counselor answers the call, another will notify the Florida Highway Patrol and give them the person's location on the bridge. The patrol will then call the crisis negotiating team at the Hillsborough Sheriff's Office, which is responsible for the bridge because the shipping channel is part of Hillsborough County. The phones were in place when 40-year-old Daniel J. LaVallie of St. Petersburg jumped to his death. He did not try to use them. The signs had not been installed then. Michael Yakes' sister jumped from the bridge in 1997. He welcomes the phones but thinks that nets would do a better job of deterrence. tbo.com, Jumped from center span. Body recovered by Coast Guard same day. The Tampa man appeared to have no broken bones or life-threatening injuries at the scene after the 197-foot drop. A 40-year-old Tampa man who jumped from the center span of the Sunshine Skyway in an apparent suicide attempt Saturday night somehow survived the 197-foot drop, deputies reported. After being rescued by a passing boater, Lee R. Baggett of [address withheld] was in stable condition Sunday in the intensive care unit at Bayfront Medical Center. Remarkably, Baggett appeared to have no broken bones or life- threatening injuries at the scene, said Hillsborough County sheriff's Deputy Dan Hillery. "This is extremely unusual," Hillery said. Anyone who jumps from a point close to the center of the bridge hits the water in about 3.5 seconds at about 75 mph. The impact usually breaks bones and ruptures organs. Only two other people are known to have survived the fall from the central span of the bridge, according to Hillsborough County Sheriff's Office records. Both occurred in 1996, records state. One was a 52-year-old Sarasota woman. The other was a 44-year-old St. Petersburg man. The bridge is one of the country's most infamous. Six people killed themselves in 1996. Eight people died in 1997. At least 12 committed suicide in 1998. Two more have died so far this year. Gov. Jeb Bush and other suicide prevention advocates have called for new safety barriers to be constructed to prohibit jumping. Baggett left behind an audio-cassette explaining his intent to kill himself, Hillery said. He also left his driver's license in his car to help identify him. Then he parked his car on the bridge and walked to the center span about 6:50 p.m., the Sheriff's Office report states. He went over the west side. A boater and St. Petersburg resident, Chris Thrap, pulled him out of the water and brought him to shore, Hillery said. Neither Thrap nor Baggett's family returned messages for comment. 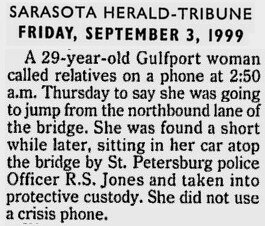 05.09.99: On Florida Bridge, Troopers Are Also Suicide Counselors. At the crest of the massive Sunshine Skyway Bridge, 200 feet above the jade-colored waters of Tampa Bay, Gary Schluter and James C. Covert of the State Highway Patrol have to persuade people poised on the edge of their own destruction to step back slowly, and live. It happens again and again to these men and others who patrol the bridge on Florida's west coast. They regularly find a car pulled to the side of the span and see a woman or man sitting or standing on the concrete railing, watching one last sunset, working up the nerve. Then, their nerves humming, the patrolmen try to convince complete strangers that lost loves, lost jobs or feelings of lost youth are not reason enough to step off into thin air. ''People look at that water and think it's very serene, an easy way to die,'' said Mr. Schluter, a 45-year-old corporal who, in two years, has been credited with saving four lives on the Sunshine Skyway. ''It's more like hitting concrete,'' said Mr. Schluter, who has seen the number of suicides, and attempts, climb steadily over the last few years. Like Mr. Covert, a 28-year-old trooper who talked down three people in four days in May 1998, Mr. Schluter has little or no formal training in suicide prevention, but they find themselves being increasingly called upon to save people who want to kill themselves at the bridge. Though the Sunshine Skyway is no Golden Gate Bridge, where more than 1,200 people have killed themselves in the six decades since the bridge was built, a rising number of suicides here has officials concerned. At the urging of Gov. 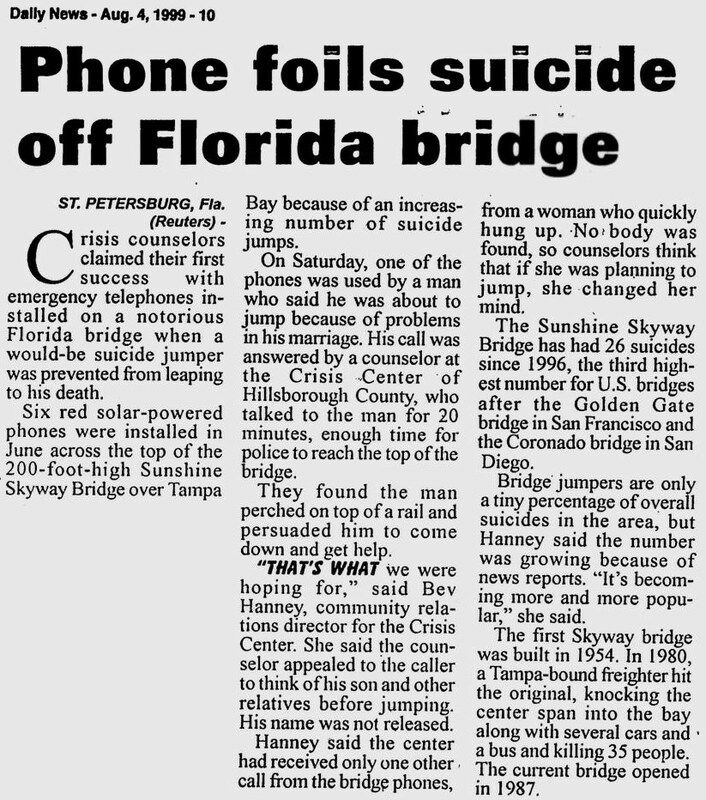 Jeb Bush, state transportation officials are expected to build a barrier -- perhaps even a net to catch jumpers -- and install telephones that would quickly connect counselors to people considering suicide at the Sunshine Skyway. In 1996, six people jumped to their deaths from the bridge, and five people were persuaded not to jump, according to police reports. Eight people killed themselves there in 1997, but 11 others were saved after being talked down by state troopers, sheriff's deputies and counselors. In 1998, Mr. Schluter said, 12 people jumped to their deaths from the bridge, and about the same number were persuaded to reconsider. In the first four months of 1999, five people died in suicides on the bridge, according to police reports, and at least four were saved, troopers said. The bridge is more than four miles long, and the troopers have often been the only rescuers who make it in time to intervene. They must frantically get to know someone in a few tense minutes, understand why the person has given up on life and search that stranger's past for a reason, any reason, to go on living. ''If they have children, I try to get them to think about their children,'' said Mr. Covert, who has saved four people. It is a drama that takes place almost in the clouds, so high that the sailboats that pass underneath look like toys in a bathtub, and most often it is just the two of them, the desperate stranger and a new best friend. The bridge, as much a fixture on west Florida postcards as alligators and orange groves, is a tourist destination in itself. But it was born in tragedy. On May 9, 1980, the freighter Summit Venture slammed into one of the pylons of the old bridge, also named the Sunshine Skyway, and knocked a part of its span into the bay. Eight vehicles, including a bus, fell into the water. Thirty-five people were killed. The state closed that bridge and, over years, built a massive new Skyway, which opened in 1987 with majestic yellow cables that rise from its center span to towering concrete posts. The bridge is also a toll road costing $1. The ones who jump usually do so before help arrives, leaving their cars and sometimes notes, apologizing, asking somebody to look after a house or feed a cat, the troopers said. If the troopers get there in time, they must be gentle, though their own hearts are pounding so hard it almost hurts, because if their words are clumsy, if their movements are too forceful, they may crumple what hope the people hold. Here, so high, hope is the next-to-last thing they lose. Once, when a man on the bridge said he was afraid of going to jail, Mr. Schluter took off his gunbelt and his shirt, to be less threatening. It all unfolds with the troopers knowing that the despondent, unstable people could reach for them in desperation and, accidentally or not, drag them into the water. The railing is a thin concrete barrier about three and a half feet high. ''It's dangerous for us,'' Mr. Schluter said. So he tries, he said, to stay out of reach. On New Year's Day, Mr. Schluter found a man sitting on the rail, his legs dangling over the bay. ''That's a long way down,'' Mr. Schluter told him as he walked carefully up to him. The man had tears running down his face. ''If you agree not to jump for 15 minutes,'' he added, ''I will agree not to try and stop you for 15 minutes.'' So they just talked. He found out the man was in debt, that he was despondent over family problems. They talked for about 40 minutes, calling each other by their first names. But the man seemed hurried by, of all things, backed-up traffic that had been caused by the drama on the span. It was as if he was sorry for causing others an inconvenience. ''He said, 'Gary, I'm really sorry but I really have to go,' and he started inching himself closer and closer,'' to the edge, Mr. Schluter said. Believing he was losing the man, he broke one of his own rules. He motioned for another officer to inch up close behind his own back, close enough to grab onto him in case the man tried to take him over the wall, then he gently laid a hand on the man's leg. That simple touch, Mr. Schluter said, seemed to break through the bubble of the man's hopelessness. ''That's what I needed,'' he told Mr. Schluter. He came down off the wall and meekly allowed himself to be handcuffed and taken to nearby St. Anthony's Hospital. Under the law, officers can take someone into custody and deliver the person to a mental hospital if he is a potential danger to himself. Most of the people who attempt suicide on the Sunshine Skyway are held for at least a while under the law, for evaluation. Mr. Schluter and Mr. Covert do not know of a single person who attempted suicide again on the bridge, or elsewhere. Mr. Schluter gives his business card and beeper number to the people he talks down, in case. Given a second chance at life, he said, most people use it. In a study of prevented suicides on the Golden Gate Bridge, researchers found that would-be jumpers rarely tried again. The troopers do not think the people they talk down are just trying to get attention. ''I believe that everyone who goes up there has the intention of going through with it,'' Mr. Covert said. One was a woman who had been in an abusive relationship, and one had lost her job. Two others had lost jobs and lovers, and just gave up. Jumpers tend to die ugly, the troopers said. The fall, less than four seconds, ends in a bone-snapping, organ-rupturing trauma, but some jumpers do not lose consciousness, and drown in agony. Sometimes, he can prove them wrong. 04.15.99, St. Petersburg Times pay-per-view, A 48-year-old Venice, Fla., man died Wednesday morning after jumping from the center span of the Sunshine Skyway bridge, authorities said. tbo.com, Left locked Mustang on southbound side of center span. Motorist saw him jump. Body recovered same day. TALLAHASSEE -- Hoping to stop a rising number of suicides, Gov. Jeb Bush wants the state to build a barrier that would block people from jumping off the Sunshine Skyway Bridge. Bush toured a Hillsborough County crisis center as a candidate last year and took to heart concerns that too many people were jumping off the Skyway to commit suicide. Now he's pushing state transportation officials to make swift improvements -- cellular phones and perhaps a fence or netting -- to one of the state's most picturesque bridges. "Hey, I'm governor now," he said Tuesday. "I don't have to wait." Law enforcement officials and crisis counselors have been worried for years about people jumping off the 12-year-old span, 197 feet above Tampa Bay at its crest. The number of people who killed themselves by jumping from the Skyway steadily increased in the mid-1990s. In 1996, there were six. In 1997, eight more people jumped to their deaths. By spring of 1998, the last time numbers were tallied, seven people already had plunged to their deaths. "It's troubling that people are jumping off that bridge in record numbers," Bush said. Bush called state Transportation Secretary Tom Barry last week to urge a speedy resolution to the problem. In a memo to the governor, Barry says the department is moving quickly to study options for a "Skyway safety barrier." Bush referred to a "netting," though Barry said Tuesday that there are many options. The department's study, to be completed by early May, would consider aesthetics, cost and even the danger from high winds. "If you have a bridge like the Skyway, when you add something to it that wasn't intended, you do have to make sure you're not creating a problem," Barry said. "There could be noise and vibrations. And if you put something up that nobody can get through, how do you maintain and inspect the underside of the bridge?" A similar proposal has led to heated debate in California, where there is intense pressure to protect the beauty of the historic Golden Gate Bridge. More than 1,000 people have jumped to their deaths off the San Francisco bridge in six decades, far more than any other bridge. Public safety patrols monitor the bridge's sidewalks, and crisis phones have been installed. But Golden Gate officials have struggled for years over the idea of a barrier. A spokeswoman said Monday the bridge's board of directors may be close to finding a barrier they like, but it has not been easy. 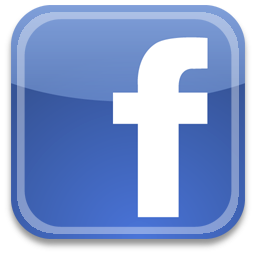 "We have not found one that is agreeable from the perspective of visual and aesthetic impact," said Mary Currie, a spokeswoman for the bridge. "We've studied a lot and ended up with a lot of rejections." In Florida, the DOT has hired the Skyway's original designers to look for a solution. Gene Figg, president of the Figg Engineering Group of Tallahassee, said Monday that it is too early to say whether he can find a barrier that would retain the beauty of the bridge. Figg said he is not concerned about obstructing the view, but is relieved that another firm won't be able to tinker with his design. "At least we can have an opportunity to make it as aesthetic as possible," Figg said. "I think that's a real plus, to have the designer try to handle the situation." Neither Figg nor Barry could provide a cost estimate for a barrier. "That would depend on so many factors, how high, how big, how long on the bridge to build it," Figg said. Bush's directive may have a more immediate result. The DOT soon will add six red, solar-powered cellular telephones at various points along the span. The phones will connect users immediately to the Crisis Center of Hillsborough County, where counselors are on duty around the clock. The phones will be located at the crest and at the piers, where suicides often occur. Bush learned about the suicide problem when he toured the Hillsborough crisis center in March 1998 with state Sen. John Grant, R-Tampa. Center officials told him the phones could help, and the advice stayed with him. A year later, crisis center officials are hoping the phones get installed quickly. "At the time a person is going to commit suicide, it's a very permanent solution to a temporary problem," said crisis center spokeswoman Beverly Hanney. "At the moment they're feeling hopeless, so there's always going to be that person who's going to do it no matter what. "But if we make it more difficult and give them opportunities to talk it out, the chance is that we can prevent it." tbo.com, Army veteran, resident of retirement community.